The above quote by the CEO of Ericsson highlights the growing significance of the telecom industry. However, its landscape has undergone a sea-change in the last few years. Many telecom companies are now in debt, and many others are struggling to stay in the competition. Due to rapid digitization, such companies are now looking for ways to sustain themselves without spending a fortune. There are several companies who are looking for ways to leverage the power of digitization to reach the maximum number of targeted customers or subscribers. However, some are also focused on reinventing their strategies to cope with the dynamic landscape, and Accurascan has immense potential to help them in this endeavor. Accura Technolabs has developed the scanning app. It is a Singapore-based company with its focus on computer vision technology. So, let's have a look at the numerous ways by which the OCR scanning app can benefit telecom companies. Majority of people find the mandatory registration process for getting a SIM card extremely strenuous. Accurascan shortens the registration process by rapid scanning of ID cards. The OCR scanner can extract text from a range of ID cards such as passport and visa within a fraction of a second. SIM card retailers only have to download and install the app on their mobile device. With a tap of their finger, they can then scan documents via their device camera and accelerate the pace of registration. This also eliminates the need for asking hard copy of original ID cards from their potential customers as a matter of proof for SIM card registration. Thus, the app successfully helps the SIM card retailers to offer an impressive first impression which goes a long way in enhancing customer satisfaction. To become productive, it is essential to have a clutter-free workspace. For a SIM card retailer dealing with hundreds of hard copies of customer ID cards and other documents of proof, this seems a seemingly impossible task. By using the revolutionary Accurascan app, he or she can effectively minimize the clutter because the app accurately scans documents in an offline mode. Moreover, Accura Technolabs also offer Accurascan web SDK which can be used to customize the app as per the business requirements. 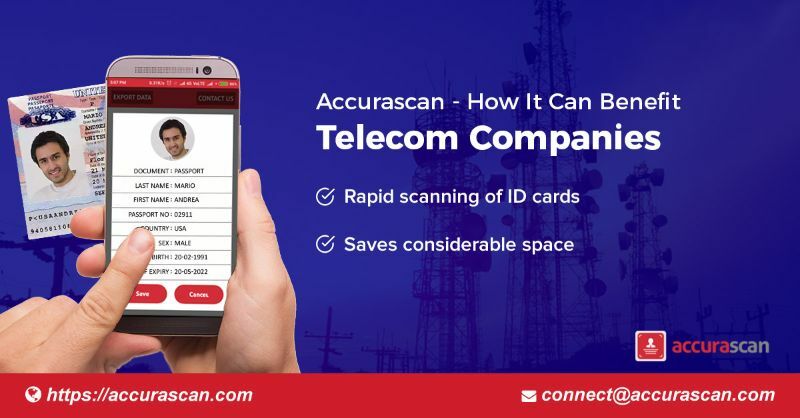 In a nutshell, Accurascan proves to be an inexpensive scanner that immensely helps telecom companies. SIM card retailers can even go for AccuraGo-a ready-to-use scanning solution which is powered by the same engine that powers the Accurascan app. With its help, they can even save the scanned data on a secured cloud server with end-to-end encryption. However, AccuraGo is a ready-to-use scanning solution which is SaaS based.